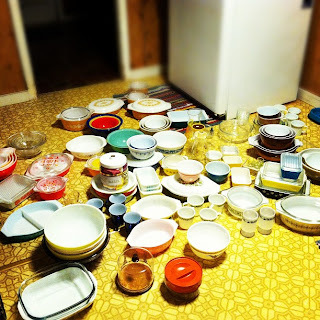 Flour Mayhem: Pyrex, A whole lot of it! Pyrex, A whole lot of it! 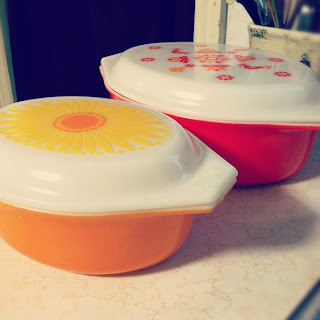 I've been saying forever how I want to take some nice photos of my Pyrex. Ones where you can actually see what I have, not the ones I post with the dishes piled high, or laying on my floor. Well, today is not that day, sorry to say. BUT, I am posting a few photos of some of my newest pieces, as well as another photo of Pyrex on my floor. It seems there's a guaranteed sea of beautiful dishes in my house at least once a week. I can't help but rearrange when I add a new piece. I always like to group the patterns together too. Silly me! Gifts from Molly. How lucky am I? I have acquired a bit more since this photo was taken, I'll be posting another as soon as I re arrange in the next week! My newest piece, from Gary. JAJ Pyrex!